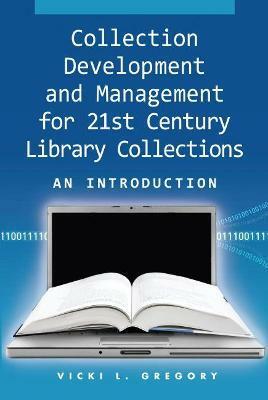 Covering virtually every aspect of its subject, Collection Development and Management for 21st Century Library Collections is a soup-to-nuts guide perfect for students and beginning librarians, yet full of sage advice and new ideas for experienced practitioners. This landmark new text was overseen by a stellar editorial advisory board: Karen Brown (Dominican University), Kay Ann Cassell (Rutgers University), Alma Dawson (Lousiana State University), Ann O Neill (Emporia State University), and Patricia Oyler (Simmons College). Vicki Gregory, Professor at the University of South Florida, takes a process approach to her subject, making the book easy to consult about a specific question or problem. Practical and to the point, here's an authoritative guide to collection development and management that covers the entire gamut. Each chapter includes discussion questions, activities, references, and selected readings. Special features include samples of a needs assessment report, a collection development policy, an approval plan, and an electronic materials license. Chapter 15: Future of Collection Development and Management.